The third and final installment of Lucerne Festival’s 2016 programming is the Piano Festival. It starts on Saturday (19 November), with Grigory Sokolov in a Mozart-Schumann recital. And he’s playing one of the pianistic holy of holies, Schumann’s Op. 17. Part of this week’s excellent program by San Francisco Symphony and Michael Tilson Thomas. It’s always interesting to see which composers turn out to be soul mates — especially when the affinity crosses barriers of time and cultural expectations. The extraordinary Swiss musician Heinz Holliger — oboist supreme, composer, and conductor — has followed the traces of Robert Schumann throughout his life, always with revealing and sometimes surprising results. This new release from ECM weaves together music by Schumann (viewed, so to speak, from an oboist’s perspective) and one of Holliger’s own Schumann homages, Romancendres (2003) — an attempt to rescue his predecessor’s burned Romances for Cello and Piano “from the ashes” (hence the current album title, Aschenmusik). 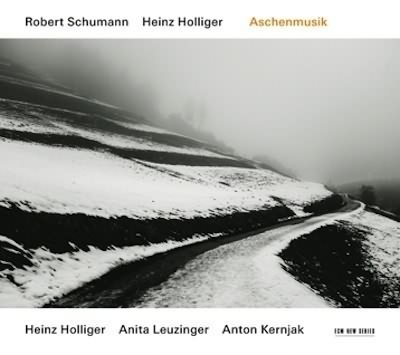 ECM has recorded this Holliger composition before (on another intriguing program that includes the Swiss composer’s overlayering of texts by Hölderlin for a reimagining of Schumann’s Gesänge der Frühe, from 1853, the same year as the burnt Romances). But Aschenmusik, released to celebrate Holliger’s 75th birthday this year, also showcases his breathtaking musicianship as an oboist. The entire CD is dedicated to Holliger’s late wife, the harpist Ursula Holliger, who died in January of this year. Granted, the tracklist is somewhat peculiar, juxtaposing Romancendres (for cello and piano) with Schumann rarities as well as other pieces arranged for oboe or cello. So we have the Six Studies in Canon Form, Op. 56 (1845), for oboe d’amore, cello, and piano; the Three Romances for Oboe and Piano, Op. 94 (1849); the Intermezzo from the “FAE Sonata” in A minor, WoO 2 (1853), reworked for oboe d’amore and piano; and an arrangement of the Violin Sonata No. 1 in A minor, Op. 105 (1851), substituting cello for violin (thus suggesting a sonic coherence with Holliger’s own cello-piano piece). But listening to the whole program — and late nights seem especially amenable to this music for some reason, I find — gives the impression of a very personal encounter with Schumann, an encounter that seeks to go beyond the myths. Aschenmusik prompts reflections on the distance between a composer’s imagined creations and what makes it to “the real world” of pen and paper, manuscript — and then what relation later generations have to these artefacts. Music history is full of stories of composers revising, frustrated by first performances, or rejecting works wholesale and consigning them to the flames. But in the case of Schumann’s lost Cello Romances, it was those who loved him who thought they were doing right by destroying his work: Clara Schumann, acting on the advice of Brahms, thought she was “safeguarding” her husband’s reputation by suppressing this and other works from his final lucid period. The fear was that the music would be perceived as showing evidence of a deteriorating mind — which in fact became a self-fulfilling prophesy in the case of the rediscovered Violin Concerto, whose reception has been complicated precisely by this bias surrounding the score. My idea was that Schumann’s entire life is contained in the ashes of the burnt Cello Romances, That’s why I wrote the four middle movements of “Romancendres” from the viewpoint of a dying man whose entire life passes through his mind in fractions of a second at the moment of his death.